In order to deliver high-quality, cost-effective health care, organizations need to act on data-driven insights based on comprehensive and accurate data from across the health care ecosystem. To achieve this, today’s health care enterprise needs a robust yet flexible analytics platform that turns raw data into meaningful and actionable information – a platform that securely aggregates and integrates multi-sourced data and enhances it with value-added methodologies and analysis. 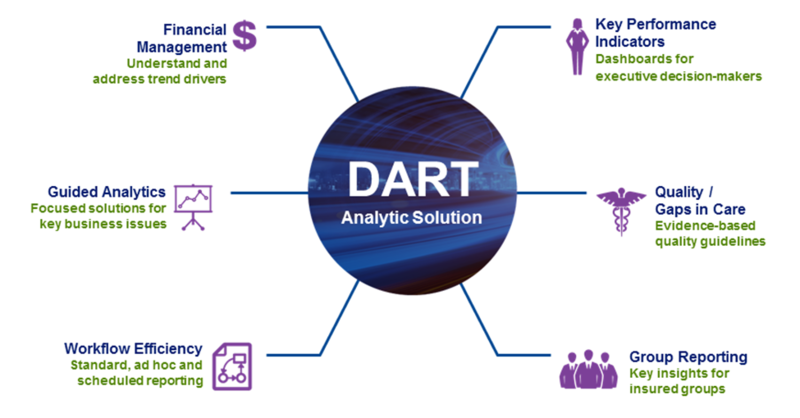 DART not only ingests the widest array of data types and sources, it adds value by performing a range of clinical analyses. Leveraging these robust analytic capabilities, data is transformed into actionable insights creating the ability to adapt to trends, improve the quality of care and reduce costs. Check out our latest release, DART 11 featuring the new Analytics View! Explore how DARTSM turns raw data into powerful, meaningful and actionable information. Discover how a large employer used analytics to target at-risk employees and improve outreach. Learn how a health plan used analytics to improve reporting and efficiencies.